This month, I had the amazing opportunity to be at the Caesar's Palace in Las Vegas, attending and speaking at Better Software Conference West 2017. It was an incredible experience, which allowed me to share topics which I'm passionate about with some of the most amazing people in the Agile, DevOps and QA communities. Those of you who know me a little bit know that I'm a passionate Agile advocate, and as a teacher at the National Technological University in Argentina, I'm very lucky to be able to transmit part of my passion to my students. But, at the university, I can only go very lightly on technical topics, as I'm just giving a fly-by view of what Agile is, so speaking at technical conferences, provides me with the ideal setting to freely explore more in-depth ideas. So this time, I presented my talk "From Monoliths to Services: Gradually paying your Technical Debt", in which I introduce people to the concept of Technical Debt as well as how to avoid it, how to classify it and how to learn when it's wise to use it in our favor. Also, we talked about the current state of the cloud, different software architecture patterns and the new Serverless trend. To round it all up, we talked about the practices required to migrate from a monolithic application into microservices-based one, showing an example of a Static Site E-commerce built on top of Contentful, Snipcart, and Auth0, using our Middleman integration. 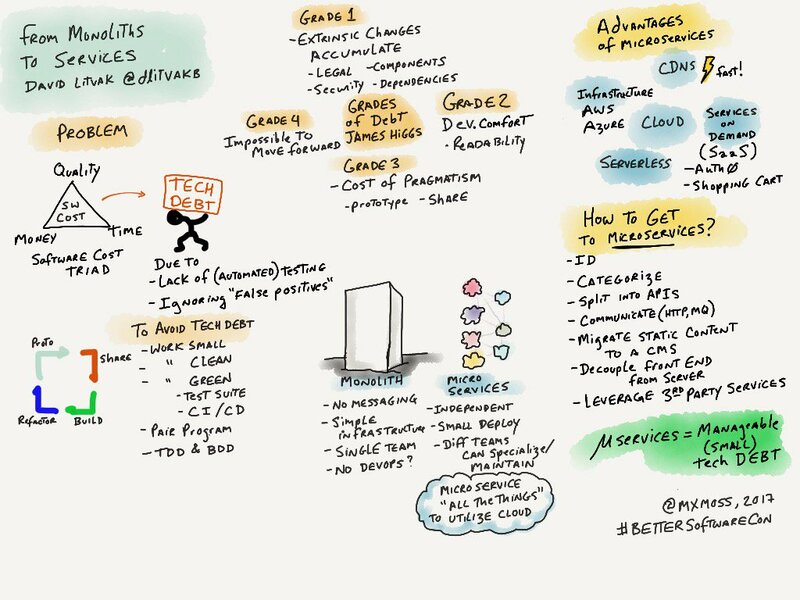 I want to give special thanks to @mxmoss for the awesome summary sketch he made of my talk. Also, if you're interested in seeing this talk live, I'll be presenting it again at CoderCruise on July 17th.